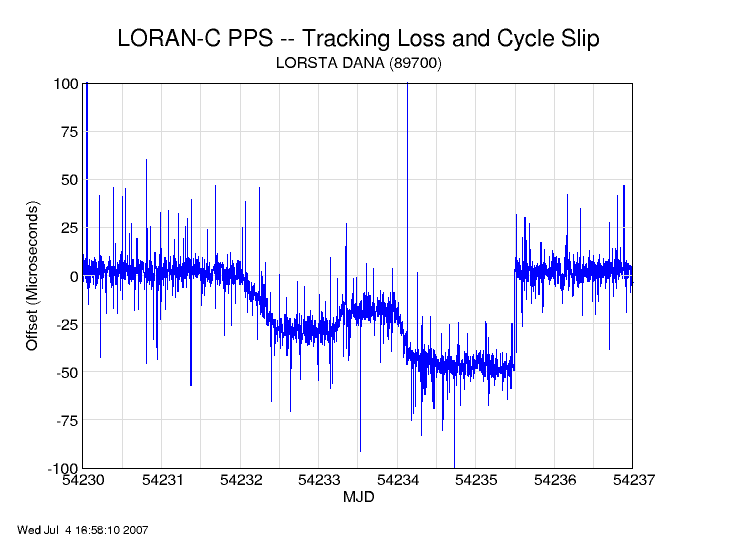 Several years after my original LORAN-C experiments, I've decided to revisit this time and frequency dissemination system. I've put together the pieces for a fully LORAN-controlled timing system: An Austron 2010B disciplined oscillator which provides the reference for an Austron 2100T timing receiver, which in turn disciplines the 2010B. The 2100T monitors LORSTA Dana, Indiana (GRI 89700), which is about 176 miles from my lab. A second receiver, an Austron 2100F, monitors the output of the 2010B versus another LORAN station -- Seneca, NY (GRI 99600), which is about 434 miles from here. 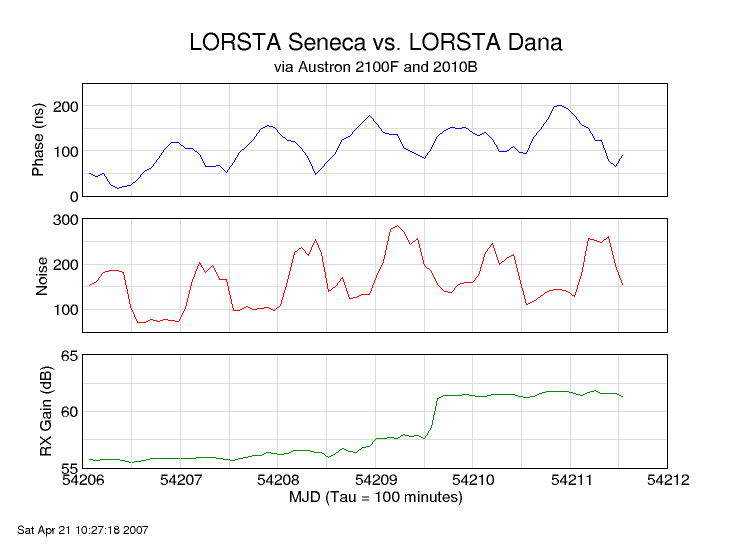 The plots below show the phase of the 2010B oscillator versus Seneca, while it is being disciplined by Dana. It also shows the noise figre (lower is better) and gain (lower is better, but...). Note the jump in gain that occurs at about MJD 54209.5. At that point, I added a low pass filter to knock down the strength of the several local AM broadcast stations. The increased gain figure indicates that the local stations were overloading the receiver, so in this case, increased gain is a good thing. The filter doesn't seem to have too much impact on the phase, though. I use my Austron 2100T receiver as a reference clock for an NTP server. Surprisingly, it normally provides better (at least, less noisy) performance than a similar server driven by a Z3801A GPS disciplined oscillator. However, one disadvantage of LORAN timekeeping, at least with my hardware, is the need to manually establish time tracking. If the receiver loses lock, it will have reduced performance until you go through the manual time acquisition process again. Here is an example. The plot below shows the effect (as seen via NTP) of two probably related events. At about MJD 54232, the Austron 2100T receiver started showing an error status indicating that the received signal strength had changed by more than 10dB, and then a bit later that the tracking point had slipped from the normal cycle 3. You can see the result, ending up with about a 50 microsecond time offset until I reset timing at about MJD 54235.5. Note: this plot is derived from NTP data maintained by cesium.febo.com, showing tick.febo.com's offset as seen over an internal 100mbps ethernet. tick obtains its time from the Austron 2100T PPS output. For more details about my NTP system, see www.febo.com/time-freq/ntp/stats/ and www.febo.com/pages/soekris.